Brakes are the backbone of a truck’s safety system. 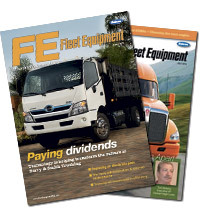 Drum brakes are the traditional solution, but what if I told you there was another option that offered improved stopping distances and reduced maintenance but was held back by every fleet manager’s least favorite four-letter word: cost? To crack the air disc brake market wide open, SAF-Holland unveiled its new P89 lineup consisting of two offerings—a base model and a premium model. We’re heading to Grand Rapids, Michigan, to get the full story on this episode of Fleet Equipment’s On the Road. SAF-Holland’s P89 air disc brake is designed as an entry-level ADB for high volume fleet orders. The P89 Plus is positioned as a top-of-the-line ADB, which offers a seven year warranty and innovations such as internally sealed bearings that prolong wheel end life.